Now that you have separated out the trash and the recycling, what about the compost? 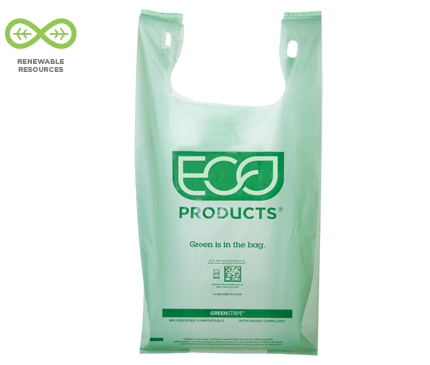 To help you out, Eco-Products offers a full line of compostable bags to meet your zero waste needs. Fully compostable and newly redesinged to be stronger and more versitile. Whether its for your walks with Fido to your latest fiesta, help keep plastic out of the compost with the perfect BioBag liner trash bags. Medium compostable bag is great for lining a variety of bins. Dimensions: 16.1 x 19.7 in. Large compostable bag is great for lining larger compost bins. Dimensions: 17.7 x 22.8 in. Perfectly matches MaxAir breathable composting bucket. Dimensions: 17 in. x 17 in. Popular 13 gallon compostable waste liner bags protect tall kitchen trash bins. Dimensions: 23.5 in. x 29 in. Popular 33 gallon compostable waste liner bags protect a range of compost bins. Dimensions: 33 in. x 40 in. Renewable and compostable liner bags for 39 gallon containers. Dimensions: 35 in. x 44 in. Divert even more compost with these larger liner bags. Dimensions: 38 in. x 48 in. Keep plastic out of the compost with our largest size compostable liner bag. Dimensions: 42 in. x 48 in.